Nehalennia – the ‘Cailleach’ of Zeeland? In 1645, storms ravaging Domberg in the Dutch coastal province of Zeeland uncovered the remains of a significant Roman-era temple sacred to the hitherto unknown goddesss Nehalennia, whose name and image was inscribed on multiple dedicatory altar-stelae. The temple is believed to have served traders at a port who would have had commerce with Gaul and Britain, and also contained dedications to Neptune, Mercury, Hercules and Jupiter, although those to the goddess were by far the most numerous. Her image depicts her wearing a tunic, shoulder mantle and cloak. Her feet are booted and she is almost always accompanied by a small, friendly-looking dog. In common with the many German images of the Matres she is usually (but not always) seated and bears a basket, patera or cornucopia loaded with fruit, suggesting she was considered benevolent. 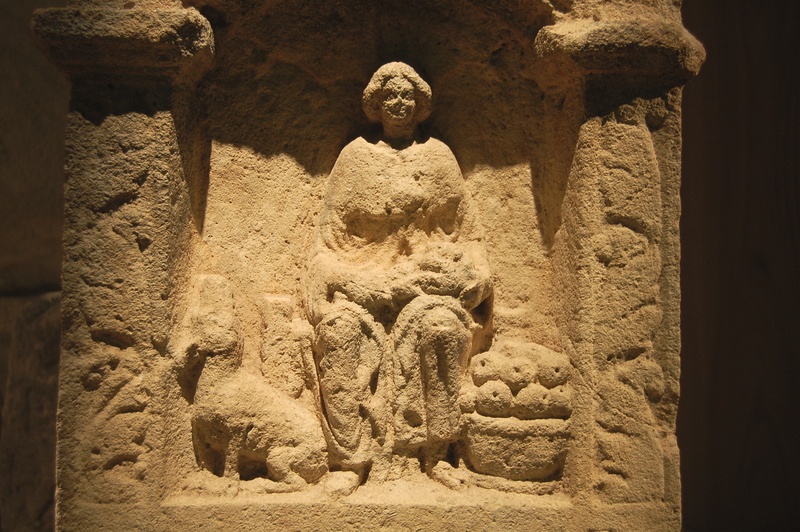 Although a local goddess, her imagery – like much of that from between the 1st and 4thC CE is obviously culturally Romanised. Her association with fruitfulness and the dog (which appears to be of the Greyhound type) would place her somewhere between the huntress-goddess <Diana-Artemis> and the fertility goddess <Ceres-Demeter>. Her boots and shoulder-mantle render her redolent of the Roman god Mercury, who (as a god of trade, and conductor of souls to the Otherworld) was depicted wearing travelling-wear. Most Roman(ised) goddesses were depicted in sandles. The overall impression is a goddess of fruitfulness, trade and travel – a fact emphasised by a number of images which depict her standing with her foot on the prow of a ship. One of the question most often asked of her is whether she was of a ‘Celtic’ or ‘Germanic’ origin. This question itself is somewhat complicated by the issue of if there is actually a cultural distinction to made between either, as this was originally a distinction made by Romans on the basis of (i) language and (ii) conquerability! Nonetheless, it is worth noting that Zeeland lies on the Rhine estuary, and that Nehalennia is known to have been depicted as a triple-goddess making her almost indistinguishable from the more common Roman-Era images of the three Matres found in Germany and France. The Matres or Matronae were typically depicted as seated and bearing pateras and cornucopias as well as sheaves of corn etc. A further shrine with altar stones dedicated to the goddess existed near Colijnsplaat in Zeeland, where a large number of altars and statues were dredged out of the Scheldt, the original Roman settlement of Ganuenta having been lost to the sea. A couple of examples of her shrines were also found as far away as Deutz – now part of Cologne, which was a major Roman civitas on the Rhine in Germania Inferior and therefore on the trade route connecting out to Zeeland and the low countries. The name of the goddess has also attracted quite a lot of speculation. As with many names transcribed and transliterated into Roman inscriptions of this era, a degree of caution is required, as the population using the name would have been largely illiterate, so the inscriptional custom of the name may not have been an accurate interpretation. Once inscribed once, it is likely to have been copied and fixed in this form. As occurs in, for example ‘Andraste’, the ‘Ne-‘ of ‘Nehalennia’ sounds like the definite article (‘the’) of the Celtic languages. In Irish and Scots Gaelic, for example, this might be ‘an’ or ‘na’. Manx is ‘yn’ and ‘ny’ respectively. This leaves us with the suffix ‘-halennia’. The terminal ‘-ia’ is typical of a Romanised goddess (‘Dia’), leaving the word ‘-halenn-‘. My suggestion is that this is an aspirated from of ‘Callen’ – a name familiar to followers of the ubiquitous Cailleach goddess-name of the Irish and British Isles. Modern Irish ‘Caillín’ means ‘girl’ – the word is evocative of that definitive female garment of ancient times: the veil or mantle – a notable feature of Nehalennia’s statuary appearance. The Irish town of Enniskillen – another trading centre on a river – is named after a pagan goddess whose name appears the same as that behind the name ‘Nehalennia’! ‘Halenn’ may therefore also be an aspirated version of the name which could also be written as ‘Cathlin’ or ‘Ceithlin’, and the seated-goddess aspect of her would fit with the Indo-European word ‘cath’, from which that sapient sitting beast, the cat, gets its name… I’d quite like to know just how old the name Colijnsplaat is for that matter – comments welcome as to if ‘Colijn’ is a version of the name of our goddess! The dog has an interesting symbolism in relation to both the Otherworld domain and human utility. Dogs are creatures who have followed human settlement for many an age, and have entered into a domestic relationship which is at times uneasy, as they are potentially dangerous. In fact, wolves – long portrayed as an archetype for man’s fearsome bestial adversaries are simply one end of the spectrum of ‘dog’. Wild dogs are features of the liminal boundaries of human habitations and roadways, and for this reason they have a ‘liminal’ aspect ideal for the portrayal of death and the otherworld. Death is feared, yet death is fruitful. A dog can be ‘man’s best friend’ or his incessant enemy. A dog can help the hunter, but the hunter can also be hunted by the wolf. 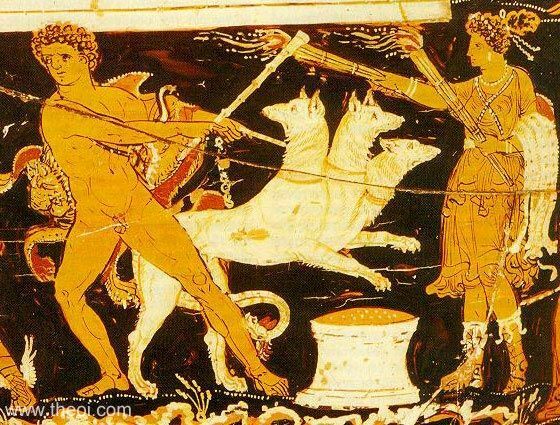 The dog in mythology represents as essence of the dual nature of technologies – to help or to hinder – and was adopted in ancient Greek mythology as a companion of the <Artemis-Selene-Hekate> hypostasis of the mystery cults. 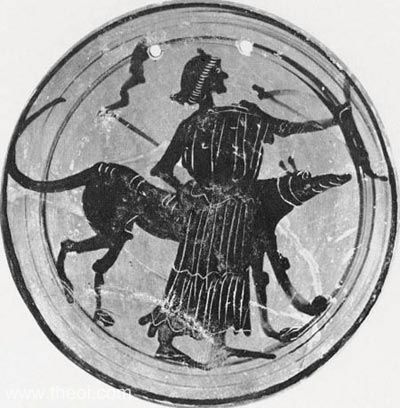 The dog was also a symbol and companion of Apollo’s ‘son’ (or aspect), Aesculapias, god of healing. The dog therefore portrayed hunting (or harvest), death and regeneration. Its place at Nehalennia’s feet, along with baskets of apples on the stealae and statues recovered from the Netherlands seems to suggest that she represented cthonic wealth and was therefore also an otherworld goddess. Ancient Greek Hekate or Artemis with her dog. Incidentally, Hekate was also frequently depicted as a triple-goddess! That the sea-voyage to Britain was particularly hazardous on account of weather and its notoriously difficult shorelines no doubt also supports the assertion that Nehalennia was a death-goddess. The pagan mindset with its belief in reincarnation had no problems equating death and fertility, as death was part of nature’s cycle of regeneration. The Greek goddess Demeter (known to the Romans as Ceres), seems to have a similar aspect, from which the tale of Hades’ abduction of her ‘daughter’ aspect Persephone/Kore derives. This tale underpinned most of the mythology of the mystery cults of ancient Europe: Eleusis, Samothrace, Orphism and the Dionysian-Sabazian mysteries. In the myths, Demeter is accompanied to the underworld by Hekate. The three-headed dog Cerberus guards the approach to Hades. On the subject of the Zeeland shoreline and its importance to trade in ancient (and modern) Europe, it is worth remembering that this is probably the vicinity mentioned by the early Byzantine historian Procopius (6thC CE) where there was a legend of the dead departing by boat for the isle of Brittia. This is a little late but I only just found this post..! The current town of Colijnsplaat was founded in 1598. The town was named after a nearby mud flat (a tidal marsh) which was known as “Colinsplate” or “Cooltjesplaat”. Both “Colijn” and “Colin” are different spellings of the same name and “Cooltje” would be a shorthand of that like, for example, “Jerry” for “Jerome”. The name of the mud flat first appears in writing in documents from 1489. Unfortunately, there are no records of who this Colin or Colijn actually was and why the mud flat was named after him. That’s really interesting! I think you are onto something here 🙂 We all know that ancient northern Europeans liked to ‘hide’ or ‘cover’ things in marshes/bogs as holy deposits to the gods/goddess of regeneration. I presume the modern Dutch word ‘kuil’ is from this shared root meaning, as is the English ‘hole’ and the Irish words ‘cailte’ (meaning ‘lost’) and ‘caille’ (‘veiled’ or ‘covered’)….